Xyzprinting has introduced da Vinci Mini after its launch of last year’s da Vinci Junior. It is much compact compared to Jr. 1.0. 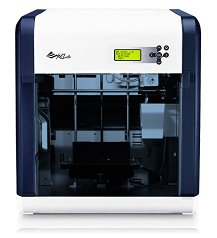 It is lowest-priced entry-level consumer 3d printers category. da Vinci Mini is fully assembled, targeted for home and beginner users. 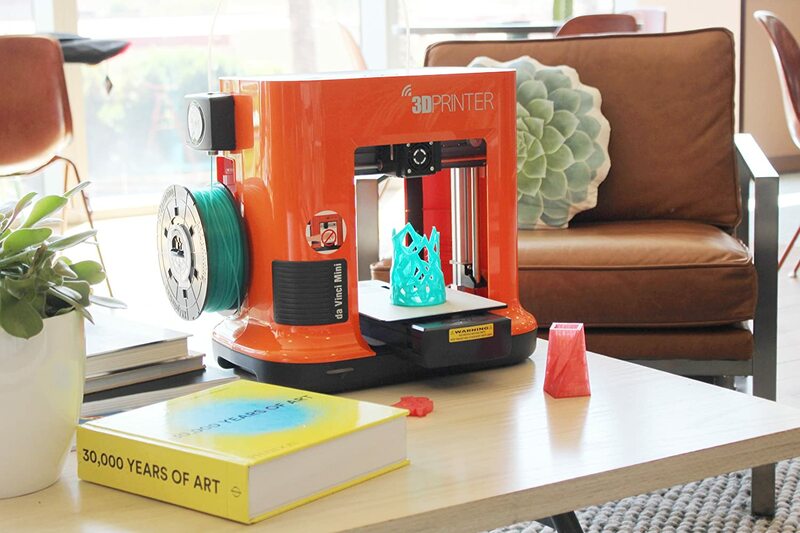 It caught the attention of all 3D printing enthusiasts with its stunning looks in orange color. This device is the perfect fit for the home with kids around because of its protective case enclosed around its printing area. You don’t have to worry about setting it up, calibration and cleaning up the nozzles. Well, we don’t say this is the flawless model but compare to other peer devices, it is much reliable and creates good quality builds. Mini can print an impressive 5.9 inch x 5.9 inch x 5.9 inches sized builds. That means you can print most of the hobby items without any constraints. 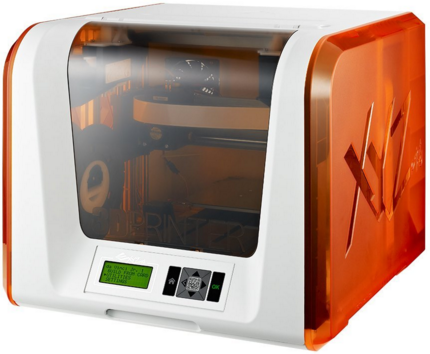 This feature is similar to Xyzprinting’s own product da Vinci Jr. 1.0.Its build size is higher to similar range products like Flashforge Finder which supports 5.5″ x 5.5″ x 5.5″. Mini can print as small as 1″ x 1″ x 1″ and as thin as down to 100 microns or 0.1mm. The layer thickness is ranging from 100 microns to 400 microns and it surpasses many high priced 3d Printers in this category. The print speed of Mini is good and could print up to max 100 mm/sec. Surprisingly, the quality at this speed is much better than its counterparts. Its single Nozzle device with 0.4 mm which is a standard size among pre-assembled models. metal free, biodegradable which is safe to use at your home. While the manufacturer wants to ensures that you use the only authentic filament. It also prevents you from using other vendor’s filament which company doesn’t support. Nevertheless, it might be a limitation for you enjoying the flexibility of playing around with different filaments of your choice. The best thing is that you will get a natural color PLA filament of 100 meters or 300 gr along with this product when you unbox it. It helps you to start right away to work on your projects at the beginning. You might plan ahead to order more filament in advance at the time of placing an order for the device . So you need not wait till the filament arrives to complete your projects in case you exhaust with filament supplied by the manufacturer. The extra filament will cost you around $20 for 600gm spool and the price is bit high compared to the filaments from other Vendors. Each filament spool is fitted with a chip inside that is read by the device. The device will let you know how much filament is left so that you can refill it again. This feature is convenient to track the filament usage. The alert might not be accurate because it indicates as no filament even when there is much length of filament is still left in the spool. Loading filament is a simple and automated task with Mini. Please note, you might not able to pause the printing in middle. If you want to print your objects with different colors, it is best to let the print completed first. Then you can sand finish it with the paint colors of your choice later. The highlight of da Vinci Mini is that its ability to connect with WiFi (802.11 b/g/n).Xyzprinting made da Vinci Mini stand apart with other devices with this feature. We can found Wi-Fi connectivity only with some of the expensive 3d printers. You can also use USB 2.0 to link to your PC or MAC. However, this device doesn’t come with SD card option which might limit the usage. da Vinci Mini comes with its proprietary XYZ are software that will slice the .stl file before sending it to the printer. The software provides basic options and user-friendly. You might find slicing is quite seamless and fast. Xyzprinting provides you with ample designs from its free resources. You could also download the App from Android or iPad to print from xyz3d gallery. 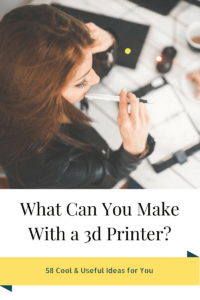 You can print the objects designed in other popular applications like Autocad, Solidworks, TinkerCad. All you need is save the files in the .stl format or Microsoft 3MF 3d files. In case you want to print the designs from the scanner of your own, load the file into 3D editing program and convert into .stl format. This device supports Windows 7 and above if you are using a PC. You can also use Mac OSX 10.8 and above if you are you are a Mac user. Some of the Mac consumers find some minor issues, Windows is stable, though. It works with the standard power input of 100-240v at 50-60hz. Please bear in mind that this device doesn’t fit with a cooling fan. At 15.35 x 13.19 x 14.17 inch (390 x 335 x 360 mm), da Vinci Mini would fit nicely on your desktop or at the corner of your house. It is compact enough to place in classroom or office room and portable to move across different locations. The package dimension is 21.65 x 15.35 x 18.50 inch (550x 390 x 470 mm) and weighs around 25 lbs(10kg). Xyzprinting has taken care to include necessary tools to ensure the device is ready to use out of the box for you. The da Vinci Mini garners a host of positive customer reviews at the time of writing. A majority of the consumers rated this product with the 5 Star and 4 Stars because they are happy with its ease of use and its reliability. Some of them are willing to ignore its limitation of restricted filament usage. Because their expectations surpass with its awesome features like Wi-Fi and better quality prints. They also satisfied with this device because they found it is the perfect fit for their home and classrooms. Few consumers mentioned that da Vinci Mini is the ideal gift for teenage kids. 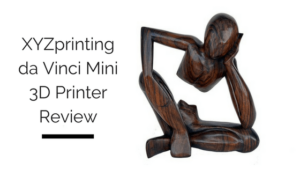 One of the review mentions da Vinci is very quite while it is printing which is the convenient feature at home to avoid disturbance to others. About 20 percent of consumers who reviewed this product rated low because they are not happy with the filament restriction. These owners have faced issues of slow response from the customer response for technical issues. Some of them are not satisfied with the quality of documentation and user-friendliness of control software. da Vinci cost you less than Xyzprinting’s da Vinci Junior and even less than other entry level products. With its price tag, you might find it is affordable for entry level user with its user friendliness and ability to produce good quality objects. You need not spend anything more than the cost price, except for the extra filament. We recommend buying Mini if you are a beginner, hobbyist, school teacher or planning to gift to your loved ones. It is one of the best entry-level model available in the market at present. You would be delighted with da Vinci Mini’s with its awesome looks. It could be the best choice for you because of its easy setup, compactness, quality prints. The Wi-Fi and Auto-calibration features are a great value add to this device which you would rarely find in this price range devices. If you are a teacher, it is the perfect fit for schools. Because XYZprinting offers online curriculum program called XYZ STEAM. 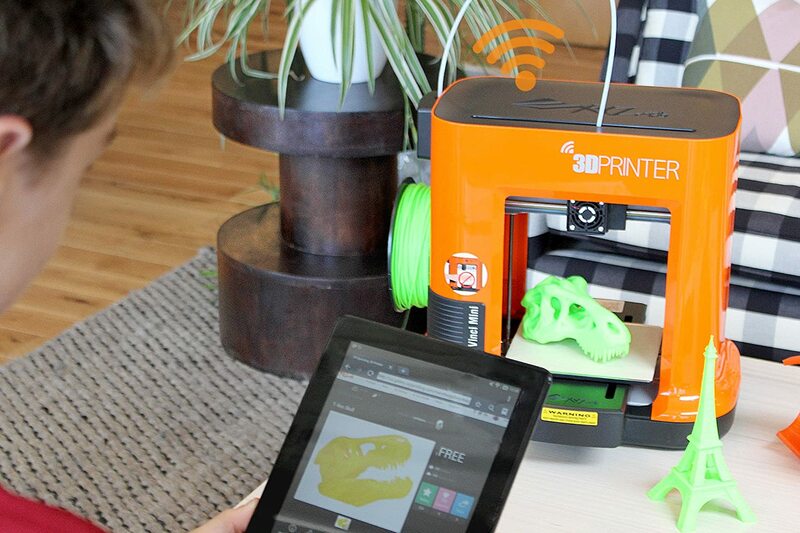 This program helps teachers to include 3d Printing lessons for their STEM program students.